FE has been a little sluggish to recover from break. To kick start us back in gear, I'm making good on one resolution by making this FE Week-of-Code. I'll try to post something useful that I've written from the past year each day. It always bugged me that I could easily plot a linear or quadratic fit in Stata, but if I used a third-order polynomial I could no longer plot the results easily. Stata has built in functions like lowess, fpfitci and lpolyci that will plot very flexible functions, but those tend to be too flexible for many purposes. Sometimes I just want a function that is flexibly non-linear, but still smooth (so not lowess) and something I can easily write down analytically (so not fpfit or lpoly) and perhaps not symmetric (so not qfit). We use high-degree polynomial's all the time, but we just don't plot them very often (I think this is because there is no built-in command do it for us). Reed Walker actually came up with this idea in an email exchange we had last year. So he deserves credit for this. I just wrote it up into an .ado file that you can call easily. The idea works really well, so long as you have Stata 11 or later (margins was introduced in Stata 11). Here's an example. First generate some false data. Y is the outcome of interest. X is the independent variable of interest. W is a relevant covariate. Z is an irrelevant covariate. Then run a regression of Y on a polynomial of X (here, it's third degree) along with controls. The standard errors can be computed any fancy way you like. Here, I've done a block-bootstrap by the variable year. Then, right after running the regression, (or when the estimates from the regression are the active in memory) call plot_margins to plot the marginal contribution of X at different values. There is also an option to save the function generated by parmest. Help file is below the fold. Have fun and don't forget to email Reed and tell him "thank you!" 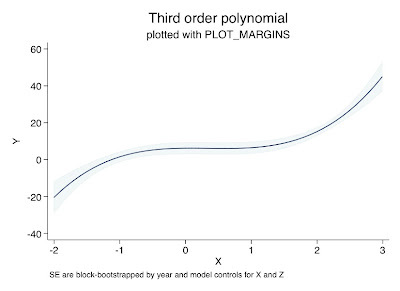 PLOT_MARGINS is designed to plot the response function ("margins") obtained from regression estimates where a continuous variable may be interacted with itself to construct polynomial or other function. PLOT_MARGINS plots the response specified by the most recently executed estimate (or a restored active estimate). 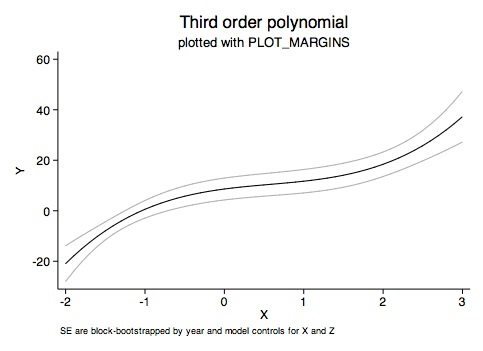 PLOT_MARGINS is designed to show a relationship between X and Y, adjusted for other variables Z1 ... Zn that are specified as controls in the previous estimation. In order to plot a nonlinear relationship between X and Y, the estimation command must use factor variable interactions (eg. c.X##c.X) in the previous estimation command. PLOT_MARGINS calls PARMEST (after preserving the data), plots the response function, then restores the original dataset. An option for saving the dataset with the estimates is included. PLOT_MARGINS does not automatically save the figure. Use GRAPH EXPORT or GRAPH SAVE afterwards to save the figure. See "help margins" for more details on the output that is being plotted. bins() - Number of "bins" that are used to plot the final response funtion. Fewer bins will make the response function look "jagged", more bins will make the response look smoother. Default is 50. SAVE_data_file() - String that specifies a path/file to save the dataset of estimates used to plot the response function. These are the values of the response function (with SE) at each bin of the independent variable. If nothing is specified, the data used to plot the results will not be saved. PLOTCOMMAND() - String arguments that are appending to the final plotting command. Eg. to label the plot with the title "X vs Y" and xtitle "X" type: plot_options("title(X vs Y) xtit(X)"). CILEVEL() - Integer specifying the confidence level to be plotted. The default is cilevel(95). Is the file temporary removed, and if yes, how can I get it? I just tried it again and it worked for me. Give it another shot. If that doesn't work, try typing "findit parmest" at the command line, and then go down to package "st0043" and click on it to install it.